The Rooted In Relationships committee hosted a meeting for 17 childcare providers, who are interested in implementing the early childhood pyramid model. This model supports home and center based childcare providers by offering coaching to build social, emotional development of young children (ages 0-8). 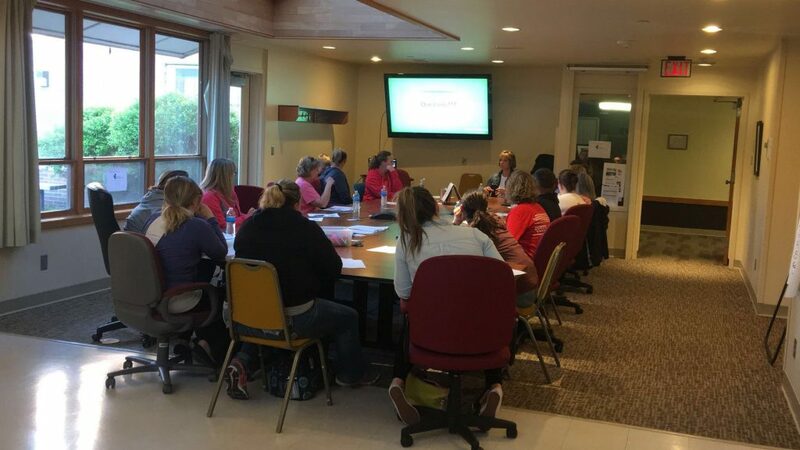 Seventeen childcare providers in Buffalo County came together to learn about the benefits of the Rooted in Relationships pyramid model. One hundred and twenty eight providers use this model in Nebraska and 24 coaches provide ongoing support to providers. Seven other counties in Nebraska have implemented the model, and coaches from those counties discussed the benefits with providers. One provider said that without implementing the pyramid model she would not have stayed a childcare provider. Through the Rooted coach model, providers are part of a team. Providers coached in this model have seen a decrease in staff turnover, which can be common in childcare centers. Buffalo County was selected by the Nebraska Children and Families Foundation to work with local partners to develop and implement a long term plan to support the social emotional development of young children (birth-8 years). One part of this initiative is to implement the pyramid model, an evidence based framework for improving children’s social emotional development and reducing challenging behaviors. Up to 15 childcare providers in Buffalo County will be selected to be a part of this program. Coaching includes professional development in the form of training and on-site coaching as well as financial support.